In this article, we will be discussing the production of gastric mucus in the stomach. We will be looking at the cells that make up the mucosa of the stomach, the process of producing mucus, the control mechanisms involved in its secretion and some clinical aspects of when things go wrong. 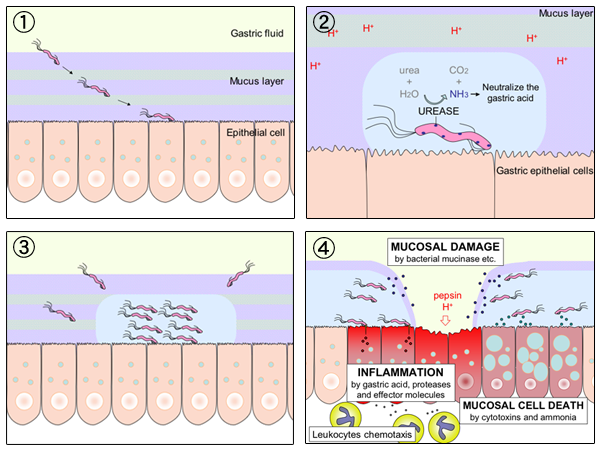 Gastric mucus is a gel-mucous barrier secreted by epithelial cells and glandular cells in the stomach wall. It acts as part of a barrier that protects the stomach wall from the acid and digestive enzymes within the stomach lumen. This barrier is also made up of a bicarbonate secretion and the epithelial cells themselves, which are tightly joined together. Together, these components prevent the stomach from effectively digesting itself. Mucus is secreted by the stomach epithelial cells, but the mucus is mainly secreted from foveolar cells, found in the necks of the gastric pits. Mucus-secreting cells are the most abundant cell type in the stomach, giving indications of how important mucus is to the functioning stomach. Fig 1 – Diagram showing gastric mucus. 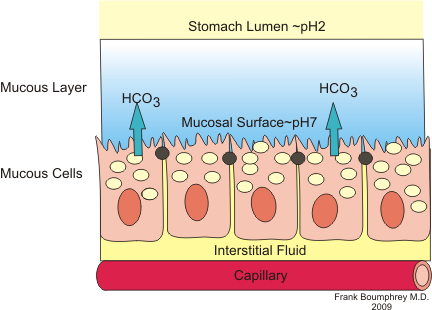 The cells that make up the epithelial layer are not spread across the stomach wall equally. All across the stomach are deep gastric glands; pits made up by invaginations of stomach epithelial cells. In the extreme zones of the stomach – the pyloric region and the cardia – these gastric glands only secrete mucus. In the other regions however, there is greater cellular diversity in the constituents of the gastric glands: Parietal cells secreting HCl acid and Intrinsic factor, Chief cells secreting pepsinogens, ECL cells secreting histamine for example. The production of mucus is conducted by stomach surface epithelial cells and foveolar cells. The mucus itself is around 95 per cent water, with the remaining five per cent made up of polymers that give the mucus its gel-like viscosity. The viscosity of mucus is dynamic and can be altered by the rate of secretion from glandular cells or rate of breakdown by proteolytic enzymes within the stomach lumen. The bicarbonate element of the mucus is important as it allows an increased pH local to the epithelial cells, protecting them from the highly acidic stomach environment. These bicarbonate ions are formed in the mucus-secreting cells by reacting carbon dioxide with water, using the enzyme carbonic anhydrase. The bicarbonate ions are then pumped into the mucus layer by exchanging them with chloride ions. Much like the control of salivary secretions, the gastric secretions (including mucus secretion) is largely controlled by neural influences. An increase in mucus production is signalled by a stimulation of the Vagus nerve and is mediated by prostaglandins. The cells respond to external factors such as mechanical stress and elements of the cephalic and gastric digestion phases by increasing mucus productions as required. In healthy patients, there is always a thick mucus layer to protect the stomach from auto-digestion. If for some reason the mucus layer is breached, the epithelial cells are exposed to concentrated stomach acid and the digestive enzymes contained within the gastric juices. As the stomach wall is made up of the same proteins and lipids as many foods we eat, if this mucosal barrier is broken the stomach will begin to digest itself, forming a peptic ulcer. There are certain precipitations to this condition, including gastric colonisation of Helicobacter pylori, exposure to nonsteroidal anti-inflammatory drugs (NSAIDs) such as ibuprofen, and excess acid secretion as seen in Zollinger-Ellison syndrome. Fig 2 – Diagram showing how damage occurs during an H. Pylori infection. The effect of NSAIDs on gastric mucus secretion has been known for around 40 years. Drugs such as ibuprofen and aspirin have revolutionised the immediate management of pain and inflammation, but can have adverse effects on the gastrointestinal mucosa. NSAIDs work by blocking the synthesis of prostaglandins, which play an important role in both pain sensation and mucosal maintenance. When prostaglandins are blocked, less gastric mucus is secreted, cellular junctions become less tight and mucosal blood flow is less adequately maintained. This makes the mucus layer less effective at protecting the stomach epithelium as well as less effective at managing any subsequent damage to the epithelium. This is why patients on chronic intakes of NSAIDs are at a much higher risk of peptic ulcers. Which cells is mucus secreted from? Which of the following does not predispose to peptic ulcer disease?